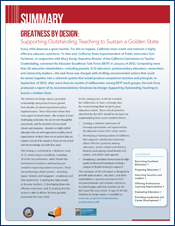 This report, produced by the National Commission on Teaching and America’s Future (NCTAF) and WestEd, describes a comprehensive knowledge synthesis of professional learning communities (PLCs) and their impact on science, technology, engineering, and mathematics (STEM) teaching and learning in K-12 education. What do we know about PLCs involving STEM teachers? How robust is the research base about PLCs involving STEM teachers? What further research and development are needed? The analysis focuses on various configurations of STEM teachers in PLCs, the purposes of these PLCs, approaches to conducting PLCs, including online venues, and internal and substantive expertise made available to PLCs. The study’s guiding questions examine the current knowledge about the relationship of these and other PLC attributes to effects on the following: teachers’ content knowledge and pedagogical content knowledge (PCK), implemented instructional practices, their students’ achievement, and teachers’ job satisfaction and retention. Read the executive summary (PDF). This study explores the connection between mathematics achievement in middle school and high school to better understand the degree to which students stay on the path toward postsecondary STEM study and, if students veer off the trajectory, to better understand when and why.